The history of Madrasah education started from the period of our prophet Hazrat Muhammad (SM). Then Madrasah education was based on religion. The subjects of their teaching were the Quran, the hadith, the duties and responsibilities of a true Muslim. Then all the Madrasah functioned well as their aims and objectives were confined to the religion and the religious teaching. But at present we have three system of education that is Madrasah or religious education, general education and English medium education. In our general system of education importance has been given only on the need based education that is science arts and commerce, on the other hand Madrasah education have incorporated world based education in addition to the religious education. Now we see that our Madrasah education is beset with various problems due to the carelessness of the concerned authority. This Madrasah education can be made important and useful if it can be restructured. So attention should be given to this field so that it can be made standard in accordance with the demand of the time. Presently the Madrasah education in Bangladesh is facing many problems. It may be classified as follows. a. Use of language by means of education. lack of govt. grants subsidy etc. Ø Stuffing pattern and salary scale. Ø Absence of proper environment. (i) Shortage of expert teacher. (ii) Shortage of training institution. (iv) Importance of technical education. This term paper is prepared with manifold objectives such as creating awareness of the people, find out the problems, its causes and remedies and finally to make this education system standard in accordance with the demand of the age. These objectives may be summarized as follows. To know the historical background of Madrasah Education in Bangladesh. To identify the present situation of Madrasah education in Bangladesh. To recommend some suggestions & solutions to the existing problems of madrashah. During the period of my foundation training course I was assigned to conduct my research work on Madrasah Education in Bangladesh: A Historical Study and prepared my term paper on it as an indispensable part of foundation training course. In accordance with the suggestions and guidelines for the preparation of the term paper, I went through a number of reference books and journals and interviewed some renouned personalities who are considered to be scholars in this field. I tried my level best to make it more informative and authentic. In this term paper I have also pointed out the objectives of the term paper method of preparation of the term paper, Source of data used, techniques applied, and limitation of doing such a hazardous task within this stipulated time. Throughout this paper I tried to maintain all sorts of impartiality. I was biased to none. Term paper is a research work. The methods that we generally use to do any research work are based on data collection. This data can be collected from two sources like primary and secondary source. I have collected data from secondary sources. Due to short period of time instead of primary data I have depended on secondary sources such as books, journals, periodicals, web sites etc have also been dependent on valuable advice from my supervisor and other NAEM faculties. The credit for this term paper data collection also goes for my supervisor Md Atiqul Islam Pathan, Deputy Director, NAEM and other faculties of NAEM. The education imparted by the Madrasah based on Islamic faith is called Madrasah education. Now-a-days some general education are included in Madrasah education. The problems and limitations that are prevailing in our existing Madrasah and it’s education system. The prospects that is visualized in the coming future in the field of Madrasah education in Bangladesh. To make a successful research on Madrasah education a lot of study is essential. But in reality I have failed to make any depth research to prepare my term paper. I have got a few copies of books on this issues namely. Madrasah Education: Bangladesh – by Abdul Haque Faridi. Bangladeshe Muslim shikhar Itihas: by Mustafa Narul Islam. Education for all by Abdullah Al-Mufti Sharfuddin. Literature on “Madrasah Education” by ProfMd Mustafizur Rahman, Prof. Monsurer Rahman and Mahbubur Rahman. Muslim Shiksha by Dr. Azhar Ali and Hosneara Begum. Education communicant report Prof. Monirzzman Mia. Besides these I have used some other sources within the short stipulated time to make my term paper a success one. 1. Unavailability of sufficient reference book. 3. Shortage of money and opportunity. 4. Lack of knowledge to prepare the proper term paper. The history of Madrasah education is very old. The need for Madrasah education was felt by our Prophet Hazrat Muhammad (SM) when the Holy Quran was revealed to him. We know that the first word of Allah that Zebrail (Am) delivered to prophet Hazrat Muhammad (SM) is “Ekra Bisme Rabbi kallagi Khalaq” read in the name of Almighty Allah. That time our prophet was basically illiterate therefore he expressed his inability to read what Zebrail said to him latter on Zebrail educated our prophet Hazrat Muhammad (SM) and there started the Islamic education. Then the education was not institutionalized and it was mainly oral later on our prophet was assigned to sprea the light of Islam, the message of Allah to mankind. So to make competent and ideal mankind our prophet formulated an education policy and that is called Madrasah education. Our great prophet continued the education in the light of the Holy Quran during the period of his staying in Mecca and Medina. After the death of our prophet Hazrat Muhammad (SM) the four famous khalifa named Hazrat Abu Bakar (R), Hazrat Omar (R), Hazrat Osman (R) and Hazrat Ali (R) were dedicated to spread religious education. Of course this education was based on mosque. At the early stage of umaya period the Madrasah education was confined to mosque. During the tenure of Omar Bin Abdul Aziz it changed it nature from mosque based to a separate entity and that is Madrasah education. The Imams and teachers are entitled to get their salary and allowance from Govt. Treasury. During the period of Abbasia’s science education started and was practised. Under the influence and financial support of the Abbasia . So Abbasias age is called the golden period of Islam. The Nizamia university of Nishapur, Mustansaria Univerity of Bagdad, Al-Azhar university of Egypt and Cordova university of Spain were established at that time. In Spain, the Muslim women were specially encouraged to education, For the first time they led the world in the field of literature and medical science etc. (Muslim Shikha- Dr. MD. Azhar Ali & Hosneara Begum). The origin of Bangla word Madrasah is from the Arabic Madrash. Its meaning is a place for study where students not only read and write but also conduct research. At first only mosques were used for imparting teaching. After that library, academic building and residence of teachers and students were constructed. Though this world is applicable for any kind of institution imparting education, in the reality it is meant as a place for imparting knowledge of secondary and higher level education of Islam through the Arabic Language. In these institutions beside the higher education perfect recitation of the Holy Quran is taught and memorizing of 30 paras is ensured. In 8th century, when the Muslim rule was established Madrasah education was provided by the mosque and maktab. Later on many separate Madrasahs for providing Madrasah education were set up. But these Madrasahs were run by public charity or help from the people. Later on many Madrasahs were established during the period starting from Ikhtiar Uddin Muhammad Bin Bakhtiar Khaljee to East Indian Company. Ikhter Uddin Md. Bin Bakhtier Khaljee conquered Bangla & Bihar in 1203. He founded his capital in Gouro. He is the first person who in Bangladesh Introduced Islamic education governmentarily. The Arab and the Irani businessmen, prechers, teachers and religious leaders played a vital role in this regard. (i) Moltan and Ucha: The Madrasah in Ucha was established during the reign of Feroji Nasiruddin Kabacha. Parhaps that was the first government Madrasah in Indian subcontinent. (ii) Ajmeer: Shihabuddin Ghuri Conquered Ajmeer in Hijri 570 and established several Madrasah there. Acconding to many, those were first madrasahs of that time. (iii) Delhi: Badshah Shamsuddin Iltutmish, after ascending the throne, established several madrasah. Muijji was the famous Madrasah of Delhi. This was established in memory of shihabuddin Md. Ghuri whose real name was Muijuddin Md. Ghuri. Other famous institutions like madrasah Nasiria, Madrasah adjacent to the grave of Alauddin Khaljee, Darul Baka in total we get the names of 16 Madrshahs. (iv) Punjab: For 175 years Punjab was the capital and the center of meeting place of wise, learned and scholars. Gojnobi dynasty patronized this. The famous Madrasas of that time were Ojir Khan’s mosque based madrasah, madrasah of Khaneshwar and the madrasah of PatialaKingdom which was established in Hijree 927. (Rise of Islam in India). (v) Agra: Agra was the breeding place of education, science and culture. The madrasah adjacent to Jame Mosque, the madrasahs of Baina, Fathefur sikri, Mothura, Bodaioon, Dara Nogar, Rampur, Shahjahanpur, Berili etc. were notable ones. (vi) Ajodha: Ajodha was the education centre, Fathegorh, Foruhabad, Jainapur, Benarash, Ajamgorh, Gajipur every place of Ajodha deserved the credit of spreading education. (vii) Bongodesh: Ikhtiar Uddin Md. Bokhtiar Conquered Bongodesh and occupied upto Nadia the capital. He established his new capital at Rangpur. There he founded some mosques, madrasahs and khankas. Sultan Giasuddin after becoming the subedar of Bangla established a mosque, a madrasah and guesthouze (Musafir Khana). In Dhaka near the killa of Shaesta Knan there was two storey mosque whose ground floor was the hostel. On the north premises of the mosque was sunny, airy and spacious rooms still are known as madrasah. It scems that the from shilalipi of the mosque it was built in 1116 Hijree. Jafor Khan estblished a madrasha in Murshidabad. In Hijree 1178 during the reign of munshi sodoruddin a madrasha was established. Calcutta Alia Madrasah was the earliest educational institution established in 1780 by the British in India. It was meant exclusively for the education of Islamic theology, Persian and Arabic languages, Islamic laws and jurisprudence. Originally founded by Warren Hastings, the first Governor General of British India in October 1780 on the request of some learned Indian Muslims. The Madrasah as warren Hastings reported to the Board of Directors of the East India company was a tremendous success beyond my expectation. He borrowed a some of three lachs of rupees from Raja Naba krishna Dev, his Dewan (financial manager) for the initial expenses of the Madrasah. He felt that he had to be certain before transfering the expenses of Madrasah to the public Accounts that the Madrasah would survive. Since then Calcutta Alia Madrasah had been working as the centre of learning for Madrasah education in this sub continent till 1947. In 1947 at the time of independence of India and Pakistan the Calcutta Alia Madrasah was transferred to Dhaka, which is the present Govt. Madrasah-E-Alia Dhaka.(www.bangladeshmadrashastudies.com). In 1871 the Hugli Madrasah was established. It followed the syllabus of kolkata Alia madrasha. The expenses of that madrasha was borne from the mohsin wakfa fund. In 1873 the government of Bangladesh for the development of the Muslim education took some steps. For this plans were devised to set up madrasahs in Dhaka, Chittagong and Rajshahi. Islmaic education expanded through these madrasahs. From the British period upto present time lots of Alia, Kawmi, Furkania and Hafejia Madrasahs have been set up which have been playing remarkable role in spreading Al-Quran and Hadith based education. The Earl committee was formed for the reformation of Madrasah education in 1907-08. This committee in their repart recomended some points of which only one was implemented. The recommendation was to improve the education of Bangladesh upto such level so that there would be no necessity to go to Deobond or Lucknow for higher education. Accepting this recommendation government brought a radical change in education. The 8-year course was furned into 11 year course (6-year junior course and 5-year senior course) and 3-year Title course was introduced. 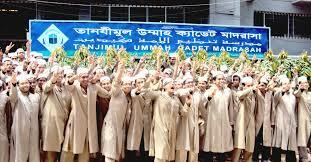 The Title course was introduced only Hadith & Tafser Department of Kolkata Alia Madrasah. Primary level (Ibtedaee): From Class one to Class five – five years. Secondary level (Dakhil & Alim): From class six to class twelve – seven years. Higher class (Fajil & Kamil): Honours & masters – two years for every course total – 4 years. Secondary level is of two levels. From Dakhil class six to Dakhil class ten is considered as secondary level. And class eleven and class twelve are considered as higher secondary level. Bangladesh Govt. has already given Dakhil the status of SSC, Alim the status of HSC, Fajil the status of Degree and Kamil the status of Masters. Without Govt. approved there are many more types of madrasahs like – Kharijee or Kawmi Madrasha, Furkania and Hafejia madrasah. These madrasahs are out of the control of the Government. No information can be get about these in the Government report. So, there is no way to know the number of such types of madrasahs, even their students and teachers strength etc. They do not get or take any fund from the Government since it becomes inevitable then to go under the control of the Government. They are fully independent and they are run by the financial patronization of the common people. The directors try to run the institutions to earn the confidence of the common people, because they can stop donating money any time. Though it is a matter of astonishment that despite so many problems the number of masdrashs is increasing every year. Generally they follow the syllabus of Darse Nijami. Of them the noted madrasahs are Hathajari and Potia madrasahs of Chittagong, Lalbagh and Malibagh madrasahs of Dhaka, Balia madrasah of Mymensingh and Jamia Emdadia madrasah of Kishorgonj. (Madrasha education in Bangladesh & effect on social life- by Dr.Md.Abdus Sattar). It is a mater of great regret that work opportunity of madrasah educated persons is very limited. Most of them get engaged in teaching at madrasah or as the Imam or teacher of Islamic studies. Those who receive higher degrees from the universities can serve in honorable positions, or pass the BCS. But only madrasah education does not permit to go for the BCS. So, it is not possible for them to serve at administrative posts. Because of madrasah Syllabus and curriculum business or financial administration, private banks and companies do not show any interest in them. Dakhil No room for Asst. Super, no common room for students, no library room. Fazil No separate common room for students of fazil level, no auditorium. Kamil No separate common room for students of fazil level, no auditorium. Directorate of secondary and higher secondary education (DSHE) is the authority to formulate the rules and regulations of Madrasah education. This directorate is responsible for overall supervision of Madrasah education. Bangladesh Madrasah education Board (BMEB) is responsible for supervising the academic activities such as formulation of syllabus and currriculam, conducting public examination etc. Recently Fazil and Kamil Degree have been given the dignity of degree and master degree respectively. In that case Islamic University has taken the responsibility of supervising higher education namely Fazil and Kamil. So there are three regulatory bodies for Madrasah education These three regulatory boodies jointly set the terms and conditions of the Madrasah managing committee. But they are yet to form a uniform system in forming Madrasah managing committee. Some where it is known as Adhok managing commitee, governing body and trust. The members of managing committee are as follows. Directorate of inspection and audit (DIA) is entrusted to supervise the financial activities of Madrasah education. But the inspection and supervision is not effective as there are not sufficient officials for doing the job. In the present system of inspection and supervision the Madrasah education is being hampered. As result the following problems arise. i. The financial irregularities cannot be detected timely. ii. It makes delay to renew the affiliation. iii. It cannot ensure proper guidance regarding education and management. Teachers are the most important element of any types of education system. Only a well trained and well educated teacher can ensure quality education. Training develops the professional skill of a teacher. But it is a matter of regret that since the establishment of kolkata Alia Madrasah no training institution was established for Madrasah teachers for a long time. Of course a Madrasah training institution has been established recently. In the administration and management many problems are there in our Madrasah education. There are only three government Madrasah in our country. All other Madrasahs are non government. The total number of Ibtedayee Madrasah is 18268. They have the same educational qualifications like registered primary school teacher. But the benefits and privileges available by the teachers of registered primary school is much more than the teachers of Ibtedayee Madrasah. Madrasah education of this subcontinent has a long history. The education began with Madrasah education. With the establishment of Alia Madrasah at Kolkata in 1780 Madrasah education got government recognition. Since then Madrasah education has been playing proper role for national development. But still Madrasah education suffers from many problems for which this education system could be made standard and up to date. It has problems in the administration in the formulation of a moderate curriculum. There is also problem in the out look of the nation regarding Madrasah education. It is due to the negligence of the government as well as the concerted group of the people. So Madrasah education needs to be remodelled and restructured in accordance with the demand of time. There is a hope that our government has taken a lot of initiatives to make Madrasah education standard and up to date. Ø To include time befitting subjects in the Madrasah syllabuses. Ø As an international language, priority should be given to English in all respect. Ø To ensure co-curricular activities in all Madrasah through competition. Ø Infrastructural facilities should be ensured i.e. required class rooms and other rooms for smooth functioning of education and management also. Ø The present system of subject-wise mark distribution and examination should be changed. Ø To bring the Madrasah teachers in an equivalent pattern with regard to general education considering salary and other privileges. Ø To prepare competent curriculum for Madrasah education to be qualified for modem age. Ø To take necessary steps to create employment opportunities for Madrasah education. Ø To ensure the implementation of daily classes, sufficient post should be created and appointed. Ø To create BCS (Madrasah education) posts like general and technical education. Ø To establish separate curriculum and text book board for Madrasah education. Ø To establish minimum one govt. Madrasah in every district. Ø The scope of higher education of teachers should be increased. Ø Research institution and scope for research education should be increased. Ø Proper and uniform policy should be made for recruitment of madrasah teacher. Ø The appointment of teacher should be transparent. Ø Teachers should be given subject based training in home and abroad. Ø The accountability of teachers should be ensured, reforming the rules and regulations (if necessary), maintaining ACR system. Ø To introduce uniform system forming the managing committee and other member of such committee. Ø To establish more Madrasah education board for better control and management. Ø To establish madrasah education directorate separated from secondary and higher education directorate to manage and control over madrasah education. Hazrat Mohammad (SM.) started preaching Islam with the purpose of removing darkness which was existing in Aiame Jahelia and bringing people to light. In this way he enlightened people and the whole mankind of his time. The materialization of high ideals preached by him can hardly be seen now. Because of the tremendous advancement of science the light of Islam is now being receded. We know that “Character, courage, industry and perseverance are the four pillars on which the whole edifice of human life can be built”. We also know that madrasah educated person can easily achieve these qualities. So, it can safely be said that only the properly madrasah educated human resource can remove the disorder existing in present Bangladesh and can make this country truly a developed one. Without this there is no way I do believe it. 04. National Education Commission Report, 2003. 06. Bangla Pedia, part 08. 09. Non Govt. Education Institution Guide – by Siddiqur Rahman Miah.